March 4th, 2019 New Releases! Check Out the WE TOLD SIX LIES Prompt Tour and Enter for a Chance to Win! 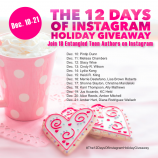 Join Entangled Teen Authors for a Fun-Filled Instagram Event! Check Out the Analiese Rising Excerpt Tour & Win! You Are Here: Home » Posts tagged "holiday event"